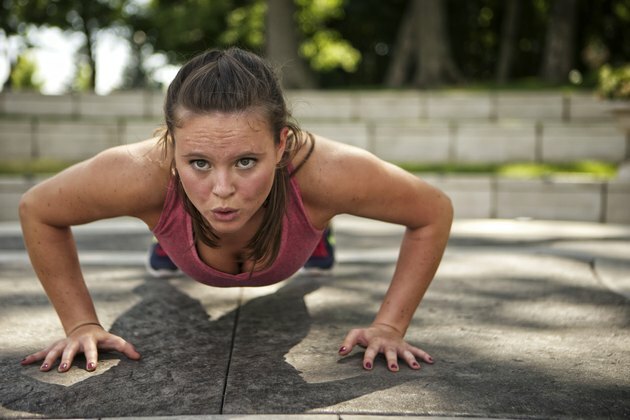 Though often perceived as a basic exercise, pushups are actually a compound move that targets your chest, shoulders, back and arms all at once. Your bodyweight is your source of resistance as you use both strength and endurance to lower and lift your body. Performing pushups with proper form and progressing to advanced variations can help to maximize your muscle development. Warm up before placing stress on your muscles with pushups; attempting to strengthen cold muscles can lead to early fatigue or injuries, both of which can compromise your results. Perform at least 10 minutes of cardiovascular exercise, such as jogging, jumping rope or climbing stairs. Perform pushups with proper form to maximize the muscle-building capability of the exercise. Come to your hands and knees on the floor with your hands separated slightly wider than shoulder-width. Tuck your toes and extend your legs straight. Pull your abs in toward your spine and flatten your lower back. Slide the shoulder blades down your back. Keep your neck neutral. Bend your arms and lower your torso toward the floor until your upper arms become parallel with the floor. Push through your hands to straighten your arms and return to starting position. Include pushups in your workout every other day; allow at least one full day's rest for recovery. Strength training can cause microscopic tears in your muscles that need proper time to repair before being placed under stress again. Overtraining can lead to injuries or even a weakening of the muscle. Performing pushups every other day can help you to prevent overstressing your muscles. Increase the amount of pushups that you do each training session or every week. Aim to add between one to five repetitions to your sets, depending on your ability. Keep the advancement gradual and avoid performing pushups past the point of fatigue, which is when you cannot perform another rep with proper form. Increase the challenge and muscle-building potential by performing advanced variations of pushups. For example, add a rotating side plank after every repetition, alternating between the right and left side. Perform pushups with one leg lifted in the air, which creates an unstable base and requires your core, back and shoulders to work harder to stabilize your body. Advance to the plyo pushup, which entails pushing off the floor with your hands at the top of the ascent phase of the pushup. Start with one to two sets of eight to 12 repetitions with the advanced versions and work your way to three sets as you become stronger. Consult with a physician before starting or advancing a fitness routine. Avoid performing pushups if you have any shoulder or back injuries or issues.